The basic structure of the inscription is clear. It is a votive dedication to the Tluskhva divinities on the part of a woman named Kanuta, who was the wife of Aranth Pinie and a freedwoman of the Larecena family. The inscription has the syntax that one would expect of a votive text: the verb turuce ‘offered’ is in construction with a genitive noun phrase tlusχval marveθul. Although the overall structure of the inscription is clear (subject NP + turuce + gentive NP), there are interpretive rough-spots. The noun lauteniθa is the archaic antecedent of neo-Etruscan lautniθa, lautnita, which appears to be the rough equivalent of Latin liberta ’freedwoman’. Whether lauteniθa has that meaning here, at this early period, is difficult to say. The name Kanuta appears to be Campanian in origin, as suggested by the Oscan idionym Kanuties (Sabellische Text Cm 24 ). Tlusχval is an inanimate genitive plural form (tlus-χva-l) that refers, insofar as we can determine, to a group of divinities whose spheres of activity are not particularly clear. 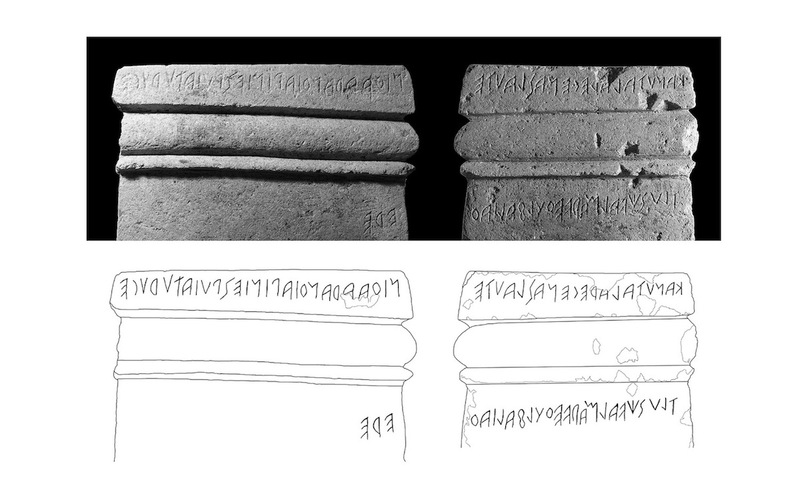 In a talk given last year in New York City at a conference on Etruscan Myth (November 21, 2009), Adriano Maggiani reported that the word tlusχval is attested on an inscription recently recovered from Caere and he speculated that the word may refer to divinities associated with the cult of Dionysius. Even so it is disturbing that divinities are inanimate in gender given that the word for ‘god’ is an animate and takes r-plural inflection, e.g., aiser. The most difficult part of the inscription to interpret is marveθul faliaθ|ere. marveθul is a genitive; the stem is marveθ (neo-Etruscan marut-). The word could be the name of a divinity and so linked asyndetically to tlusχval. Another possibility is that it is an epithet of Tluskhval divinities. Stopponi (2010) thinks that marveθul is to be connected somehow to the stem maru-, which refers to a type of magistrate. But the interpretation she provides is in no way convincing. faliaθ|ere is a locative form ‘in faliathera’. The internal structure of faliaθ|era– is unclear. What the word might mean, apart from the fact that locative case suggests a place, cannot be determined from the context. Gross morphological similarities led Stopponi to connect the word with the gloss falado ‘sky’. This requires a certain amount of ad hoc pleading. As a result, the interpretation is unappealing. Stopponi indicates that the date of the inscription is ca. 525-500 BCE. The date fits reasonably well with the palaeography. The letters belong to Maggiani’s ‘intermediate’ phase of development at Volsinii: retrograde s, but theta without a medial point; rho and khi without tails. Stopponi, Simonetta. 2009. Campo della Fiera di Orvieto: nuove acquisizioni. Annali della Fondazione per il Museo «Claudio Faina» 16.425–478. Photograph and Drawing: Stopponi 2009: 478. 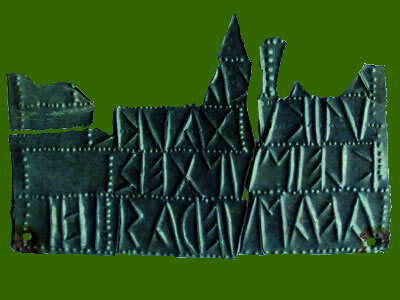 A Raetic inscription incised on a small bronze plaque was published in the 2006 issue of ArchaeoTirol (see photograph). The plaque was found in a religious sanctuary discovered at Demlfeld in Ampass near Innsbruck. Excavators have recovered over 2,000 objects, mostly votive offerings, including the bronze head of a hippocampus with a Venetic inscription on the reverse: vhilone.i. /filo(:)nej/. My colleague, Carlo de Simone, mentions an intriguing morphological analysis for avaσ́uerasi. He suggests that the form is a plural pertinentive, in which case the composition would be avaσ́ue-ra-si. Compare, for example, Etruscan clavtieθu-ra-si ‘members of the Clavtie-family’ (r-plural, s-pertinentive). Tomedi, Gerhard, Simon Hye, Reinhold Lachberger, & Siegfried Nicolussi Castellan. 2006. Denkmalschutzgrabungen am Heiligtum am Demlfeld in Ampass 2006. Ein Vorbericht. ArchaeoTirol 5: 116–122.